I’ve always considered strawberry begonia plants as an indoor plant, since that is the way that I have generally grown them. 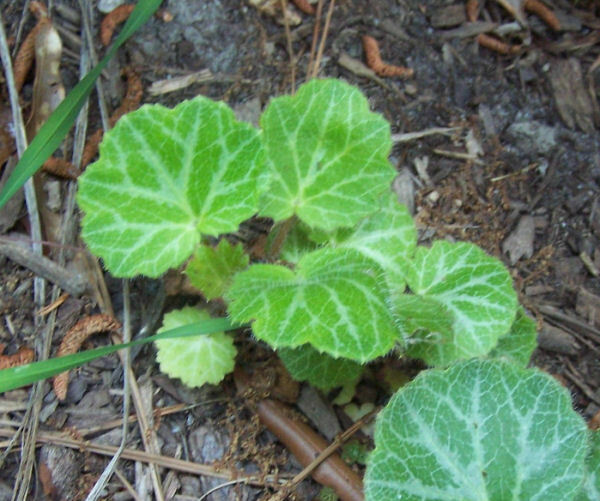 But I had a surprise this year when I discovered that the plant is a hardy perennial for me here in North Carolina. I purchased several small strawberry begonia plants last spring. I was intending to put them into strawberry pots and have them on my patio during the summer and then bring them indoors. But time got away from me and the plants were not looking so great, so I planted them directly into a side border that gets filtered morning sun and afternoon shade. I then forgot about them. I thought they would probably die over the winter but to my delight, they are robust and growing well this spring and have spread over the side bed. 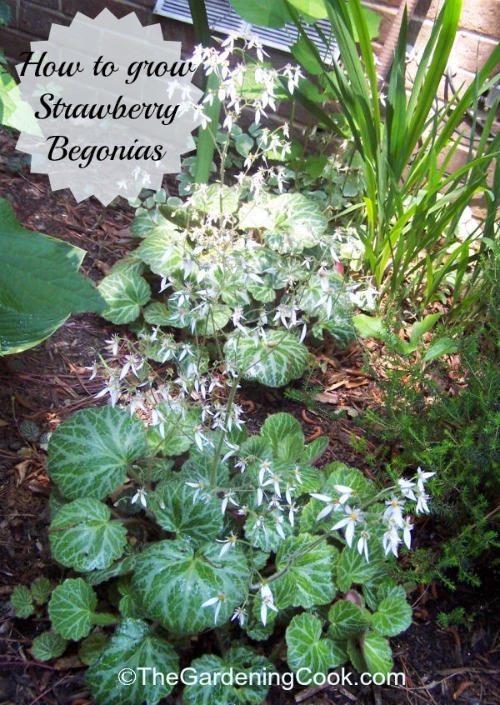 Strawberry begonias grow in the same way that normal strawberry plants do. They produce runners that end in small versions of the parent plant. Anywhere the base of these small plants sit will attach to the soil. They can then be dug up and planted on their own, or left to fill in a bed as mine are doing. 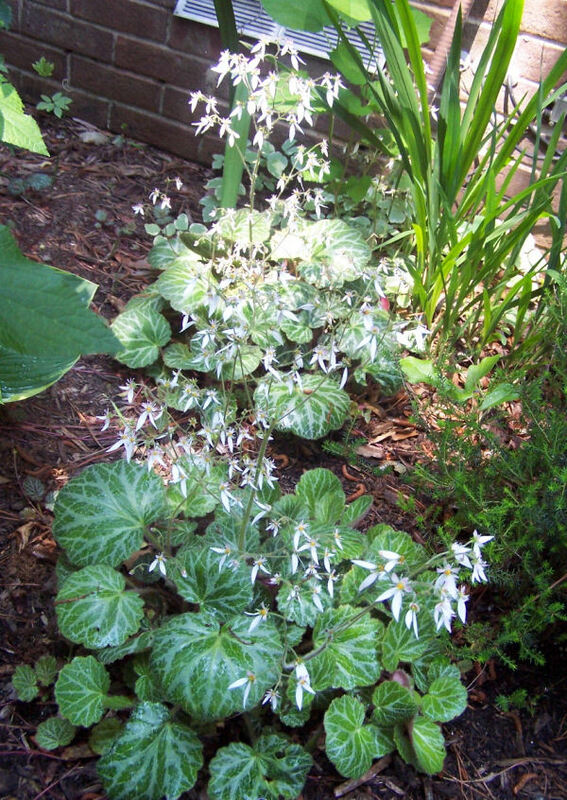 The plant produces long stems with fairly insignificant, and delicate white flowers. Like many begonia plants, this one has a pretty and interesting leaf with somewhite marbling through it. To grow strawberry begonias follow these steps. Light – bright light to filtered light but do not like direct sunlight for many hours. Watering – evenly moist in well drained soil, which has been amended with organic matter. Try to water at the root area since the leaves are hairy and will resent having water pool on them. They prefer cool climates and resent extreme changes in temperature. Growing them next to your house will help. Fertilize with organic matter such as compost or use a weak fertilizer that encourages blooming. If you grow them in pots, re-pot each spring since they don’t like being pot-bound and will not look their best. As with many fleshy plants, they are susceptible to mealy bugs and aphids, so treat infestations as early as possible. If you grow these plants indoors, mist weekly. They like relatively high humidity. Here is a photo of one of the plants which has a decent sized offset growing near it. It will be a lot bigger in about a month. Each one of these offsets will make a new plant. The babies look great in strawberry pots, with each offset planted in the small side sections. The babies will cascade over the side of the pot, making a fabulous display. For more gardening ideas, please visit The Gardening Cook on Facebook. Hi I have been on the Internet for hours trying to buy a Strawberry Begonia plant. I live in MO. Where do I go to get a starter at?? I do not want to pay 30 bucks for a plant. So tell me where do I get these starter plants at? Thanks for your help. Hi there – My Mom grew strawberry begonia as a groundcover for years in Kansas on the north side of her house. I’ve been looking for them to plant. Hi Mary.. If you know anyone who has a plant, the babies will root easily.